Angel's Creative World: Birthday Blog Hop Celebration! Hi all! Welcome to Michele's 50th Birthday Bash Blog Hop Celebration!!! Our fearless leader is celebrating her birthday in a BIG WAY! We have an awesome blog hop with FAB prizes! Michele is giving away 5 $50 gift certificates! YES - 5!!! Simply comment as you hop along for your chance to win! You should have arrived here from Larissa'a Blog. On to my card! So I kinda goofed which means y'all get a SUPER sneak peek at a soon to be released set! Sign up for the CAS-ual Fridays Stamps Newsletter for more info! 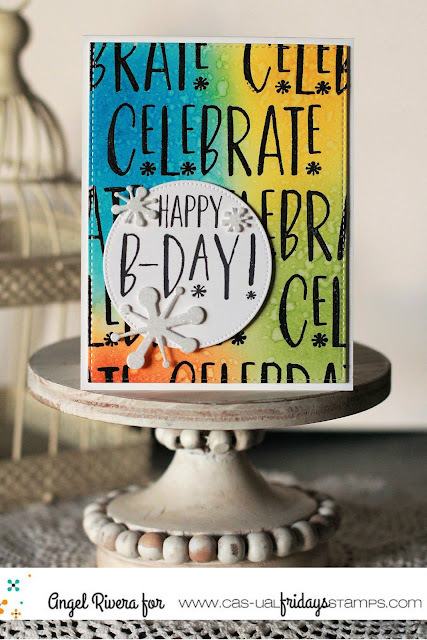 I embossed 'Celebrate' with black embossing powder then sponged on some fun inks, blending slightly as I added each color. I then spritzed with water and let it sit for just a couple of minutes before soaking it up with a towel. I used glittery paper to cut out the fun trio of dies that go along with this set! Again - a SUPER Sneak Peek of a set being released in May! Hop on over to Nora's Blog next!!! Your card really showcases Michele's style and your background is stunning, Angel! Really nice colors. Based on the fun colors in the card looks like would be a fun party. Hehe... Thank you! Love that Celebrate stamp! I can't wait for it to be released!! Very nice Angel and I LOVE the font on the Celebrate stamp. A nice card. Super cute card! Great colors. So pretty! Love the words in the background against all those gorgeous colors! Love your background colors. Great b'day card. Love the big words on the colorful background! Love your card. The colors are so pretty. I love everything about this card! Gorgeous background!!! Love your card! This is so cool!! Your background is SO COOL!!! Fabulous use of the new set! Love this bold, happy card! Pretty card! Love the background colors, and I am one, i dont want a number on the front.. so perfect.. happy birthday michele! Have fun celebrating! Really love your background combined with the black & white contrast! I love your color combo for the background. Backgrounds are so fun. Fun, bold and graphic card. Perfectly festive! I was wondering how I'd missed this set, then re-read your note - diggin' it already...the font, what you did with the background. Fabo! Great color blending on the background and the graphic repeating sentiment. Very nice job on a lovely card! I like how you did the repeat on the word "celebrate". Love your background and colours you chose. Pretty card and love the colors! Oooooooooooooh! I love sneak peaks. Love your colors and design. And that large font is amazing. Can't wait to see it in May. A lovely card. Yummy, beautiful and fun! Love it! Very festive with the colorful background. Simply LOVE that background. So bright and happy. What a bright and fun card!!! What a gorgeous card and colors! What a fun cheery card! Thanks for sharing. Your card has such a pretty inked background!!!! Lovely card! I love how you made the background!! Great job!! I love how you made the background!! You made your own paper!! So cool!! Great card!